Second only to mosquitoes, ticks are known worldwide for the spread of diseases in domestic animals as well as humans. 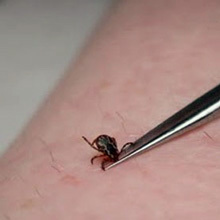 Tick bites are not only itchy; some types of ticks also secrete a neurotoxin through their saliva causing paralysis after prolonged feeding. Hence, proper tick removal is as essential as timely removal to prevent diseases like Rocky Mountain fever, Tularemia, Colorado tick fever etc. Many of these tick borne diseases can be prevented by following proper first aid for ticks/tick bites. In regions where ticks are common, it is essential to wear long sleeved clothes, long pants, socks and closed shoes. When hiking through tall grass, make use of insect repellents like DEET. These do not kill ticks, but they do repel them. When camping, avoid placing clothes on the ground where they might be infested with ticks. Set the camping site away from ground growth and vegetation. Workers in infested areas should be educated about proper steps of tick removal as well as first aid for ticks/tick bites procedures. At the end of the day, they should disrobe completely to ensure there aren’t any attached ticks. If need be, workers in infested regions must inspect each other backs. During work hours, they should feel their necks several times to ensure no ticks are present. Use blunt curved forceps to remove dog or human ticks. If you are using your fingers, protect them with gloves or tissue papers first while removing the tick. Do not jerk or twist the forceps as this might cause the mouthparts of the tick to remain in the skin. Do not squeeze, puncture or crush the tick’s body as this may lead to infections through skin cuts if by chance they come in contact with infected body fluids of the tick. Do not handle tick removal with bare hands. Children should be educated about proper methods of tick removal in pets. Thoroughly disinfect the site of the bite using warm water and antibacterial soap/disinfectant. Dispose the removed ticks by flushing them down the drain or drowning them in alcohol. Do not use traditional methods of tick removal such as nail polish remover, rubbing alcohol, hot match heads, petroleum jelly etc. Not only can these be seriously injurious; they can even cause the tick to salivate leading to various skin infection. If the tick has dislodged, it can be a bit difficult to diagnose tick bites. If it is still attached, seek prompt first aid help for its removal. Diseases like Lyme’s, Tularemia, and Rocky mountain fever take weeks for the symptoms to show. Blood tests can confirm the exposure. The first step in tick removal is to ensure that it has not left its mouthparts in the skin. The area of the bite will have a crater/indentation. This should be cleansed thoroughly using antibacterial soap. Observe the site of the bite for a few days. If you see signs of a skin infection such as rash or blisters, seek medical help. Apply anti bacterial cream and take oral antibiotics as prescribed. Hands contaminated with tick’s body fluids must be thoroughly washed with soap and warm water. Watch out for unusual signs and symptoms like fever, muscle ache, and fatigue etc even after the tick has been removed and the wound treated. Ticks are capable of crawling inside loose boots and up the trouser legs to search for uncovered skin. In the US, the Rocky Mountain fever or spotted fever is considered one of the most infectious diseases, which, if left untreated without proper antibiotics can even lead to death. Broad spectrum antibiotics like tetracycline and chloramphenicol must be administered early following proper first aid for ticks/tick bites. Dog Tick Removal Service – Do Groomers Remove Ticks?